We’ve looked at suggestions for the menfolk and I showed you some of my favourite gifts for girls, but today let’s get to the good stuff – as in, the stuff I’d like myself! Here’s my cut out and keep – or bookmark and visit later – guide to buying for the women in your life – or, if you’re feeling cheeky, send the link on to a loved one as a fairly heavy hint! ONE: New Irish brand Nima Brush have blown me away: they make high quality, professional grade brushes that are brilliant to use, wear and wash well and are also affordable. If there’s a serious makeup lover on your list, put a big smile on her face with this 7 piece essential set, €65, which comes housed in a sturdy yellow case. Check out my review over on beaut.ie here, or visit their website for more. TWO: I haven’t worn a wristwatch since I was a child but with this unisex number I could definitely be tempted. The Adidas Sydney is a little bit retro, a little bit bling and a whole lot fabulous. Also comes in stainless steel, or stainless steel and gold – it’s £92 here. 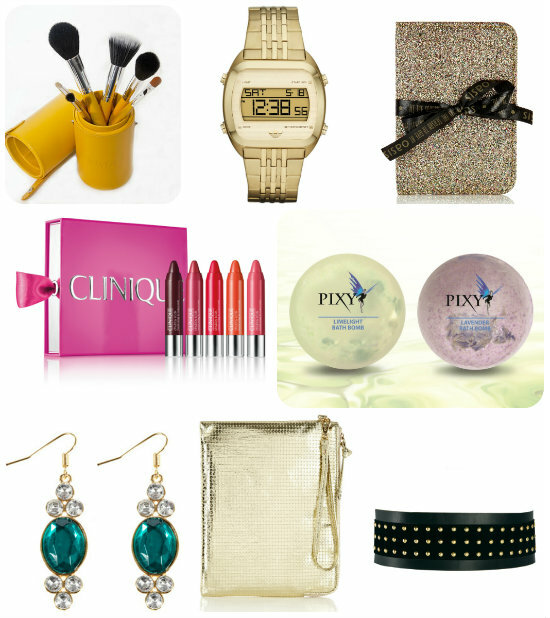 THREE: Oasis have come up with a gorgeous and covetable range of accessories as stocking stuffers this year. The prettiest notebook I’ve seen in a long time, this sequinned lovely is just €10. WANT! FOUR: I’m mad about this set of five mini versions of Clinique’s gorgeous Chubby Sticks – including my favourite, Chunky Cherry. Great value at €35, too – a full sized version is €19! FIVE: Who doesn’t love a bath bomb? Pixy is Ireland’s natural skincare range –they’re similar to Lush – and these babies are hand-made using all sorts of lovely ingredients. The Jingle Bombs set is €9.99 for 4 – individually, they’re €2.99. Find them here. SIX: Statement ear-rings are a total must for the party season. I might have missed out on the Lulu Frost beauties that caught my eye but these drop ear-rings from Warehouse would help ease the pain. They’re €11 here. SEVEN: Also from Warehouse, this sequinned iPad case, €21, ensures even her gadgets will be getting their bling on for the party season! EIGHT: I’m loving this studded belt – it would dress up any outfit in a jiffy and add a touch of rock chick glamour. It’s €20.84 from ASOS, here. Feeling inspired by any of this little lot? How are you getting on with your shopping this year? Fabulous picks Emma, adore the earrings especially. BTW the Chanel bracelet costs £410 - let me know if you get one! Great picks! I really love the chubby stick gift sets and also, how amazing is that note book from Oasis?! Love it!!! ooooh lovely ideas for pressies and stocking stuffers! Love these, especially the belt! I know I wouldn't mind if any of these lovelies showed up under my tree! Fab picks Emma! Great picks! I like the earrings and the watch. I LOVE clinique's chubby sticks, those miniature versions are even cuter! Onto the wishlist it goes! Happy Friday to you! I mist admit that I have just ordered the chubby sticks set for myself. I love your picks here. Can't go wrong with pretty stationery!